With recent rains elongating the planting season this year, some producers may be tempted to plant shallower to avoid placing the seeds in wet soils or to get the crop to emerge quicker. Unfortunately, corn roots may not develop properly when planting too shallow and the stands may not grow uniformly. Corn should be planted 2 to 3 inches deep to develop a good root system; most corn planters are designed for at least a 2-inch planting depths. 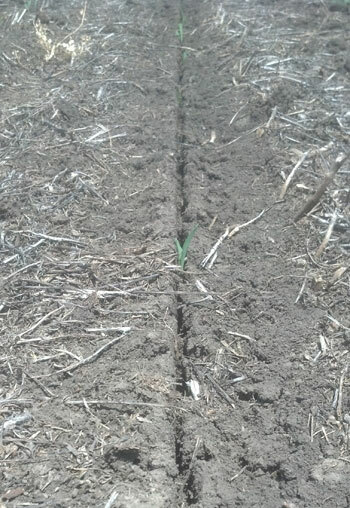 The openers cut through residue and soil better when running at least 2 inches deep and they form a better seed-vee. Soybeans should also be planted about 2 inches deep when using a planter. When planting shallower than 2 inches, the angled closing wheels on many planters pack the soil below the seed and don't properly close the seed-vee. This problem is worse in wet conditions as the wet soils are easily compacted, reducing the penetration ability of the corn roots. When the soil dries, it shrinks some and, depending on the clay content, the seed-vee may open up, drying the soil around the seed even faster. If the seed-vee was smeared some at planting time, the smeared sidewalls may bake hard, making root penetration even more difficult. Even if the seed was planted at least 2 inches deep, soil smearing and seed-vee opening may still be a problem if the crop was "mudded in," which is why it's important to wait for the proper soil conditions. The seed zone is also more likely to dry out when planting too shallow. While it may have been fairly wet when planted, the top layer of soil dries fairly quickly. If there is an extended warm, dry period after planting, there may not be enough soil moisture in the seed zone to get all the seeds germinated uniformly. Some plants may get started early while other seeds are waiting for the next rain for enough moisture to germinate. Worse yet are the seeds that germinate then die because they didn't have enough soil moisture to get a plant established. Planting deeper provides a more buffered soil moisture for a more uniform emergence and more moisture to get the plants established. The soil temperature is also more buffered, resulting in more uniform growth.